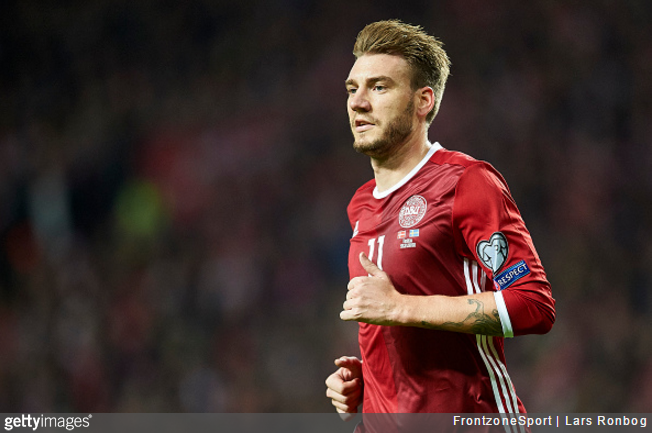 We’re not entirely sure if this is good news or bad, but it looks like Nicklas Bendtner’s next port of call will be Nottingham Forest. A free agent after being cut loose (with a year left on his contract) by Wolfsburg at the end of last season, Bendtner has apparently held discussions with a couple of other Championship clubs, but it looks like Forest were the only ones willing to pursue things further. According to the Guardian (among others), Bendtner is currently in “advanced talks” over a move to the City Ground. Indeed, the Nottingham Post are even claiming that the striker has “verbally agreed a deal”. While he’s only 28, Bendtner has become something of a parody in recent years, having fallen into a tiresome, self-defeating rut – favouring public urination, multiple arrests, posing naked on Instagram and miscellaneous other disciplinary lapses over actually knuckling down and wresting his career from sliding into the abyss. If he’s coming in at Forest with his head is screwed on and a sense of renewed vigour, then the Reds might have snagged themselves a bit of a coup. The Danish target man could – could – have his fill in the Championship, and a partnership with the lively, ever-predatory Britt Assombalonga could prove to be a fearsome prospect given time to gel. However, if he’s planning on staying true to form and half-arsing it from hereon out then, by god, that contract best be bunged up to the hilt with performance-related break clauses, etc. Sadly, prudence and foresight are hardly words you’d associate with the current Forest administration. Hey Chris, at least you avoided Mario.